A Lewis machine gun with a Foster Mount on a Royal Aircraft Factory S.E.5a. 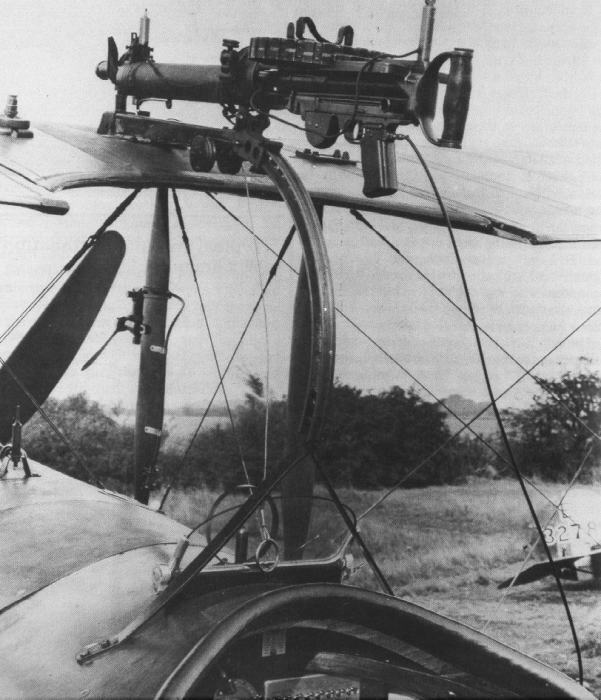 During World War I, Royal Flying Corps (RFC) aircraft with forward firing machine guns were normally limited to pusher-aircraft on which the engine and propeller were behind the pilot. With these aircraft, the propeller was well out of the way which prevented the propellers from being shot at and damaged. Single engine tractor-type aircraft did have the capability of forward firing guns, but these were mounted on the top wing above the pilot, which made reloading very difficult and dangerous. For ease of reloading, the Foster Mount was developed by Sergeant R.G. Foster of the No. 11 Squadron of the RFC in 1916. This device allowed a machine gun to be fired above the propeller arc, but it was mounted on a track that could quickly pulled down allowing the pilot to quickly reload his guns with much less effort. Earlier In 1914, French pilot Roland Garros developed metal deflector plates attached to the propeller that would deflect any bullet that hit the propeller when a gun was fired through the propeller arc. It was finally put into use in March 1915. Shortly thereafter on April 18, 1915, Garros shot down three German aircraft and he himself was forced down in Germen territory. Before he could burn his aircraft, it was captured and was sent to the German aviation military for evaluation. This led to the invention of the interrupter mechanism by Anthony Fokker in 1915. This allowed full forward-firing , machine gun synchronization through the propeller arc without the bullets striking the blades. Although Fokker is credited for inventing the interrupter, his invention may have been based on a synchronizer invented earlier by Swiss engineer Franz Schneider in 1913. Created May 2, 2011. Updated December 23,2012.